This was written May 24, 2008.
kayaking! The end of the summer of 2005 was marked by daily thunderrstorms which made trips nearly impossible. Then in August, Hurricane Katrina tore through the Gulf Coast and fifteen tons of oak tree on our house took precedence over kayaking. That winter I developed adhesive capsulitis, or "Frozen Shoulder". Movement of my left shoulder became extremely painful, difficult and then impossible. Two years of slow, painful rehab followed. Everytime I was in the gym, tempted not to push up those weights one more time or not to do that stretch I hated so much, the hope of kayaking in the future pushed me along. As my progress crept on, slowly I began to have hope. Then at one point I realized it could definitely be a possibility. Then it was simply waiting for the water to get warm enough, the weather to be nice and me to not be on call. Today was that day. We put in around 6pm and the timing could not have been better. 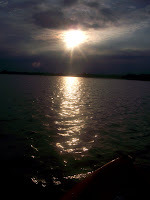 The afternoon sun reflected like diamonds on the water, there was a soft, warm breeze and the temperature was perfect. As we started out, I realized Glen had forgotten to put on his personal floatation device. He wouldn't go back to get it, but instead said we would just "go slow and easy". That was a good idea anyway. We had just come from the gym and my muscles were tired from lifting weights. Glen was tired as well. After not having been in our boats for a few years, it was like starting all over again. The first few minutes in the boat were very emotional for me. It was as if I had worked so long and so hard to be there in that water, enjoying the beautiful, peaceful surroundings that it made my eyes well up with tears. We paddled around in the bay and enjoyed the scenery. We saw several alligators and plenty of fish -- one almost jumped in my boat! This first outing after so long was about as perfect as I could want. We had a good time, we were careful (except for Glen not wearing a vest) and we regained some confidence. Now we are ready for something a little more next time.